Since 1976, Hubbard House has offered life-saving and life-changing programs and services to victims of domestic violence and their children free of charge. Our efforts are only possible because of the generous support we receive from individuals and organizations, who believe victims deserve to live a life that is violence-free. This community support spotlight focuses on Veritas Boutique and its owner Nadia Sanchez. Veritas Boutique specializes in jewelry and most of the pieces are hand-made by Nadia herself. In the past year, Nadia has held two events in which a portion of the proceeds from a month’s sales were donated to Hubbard House. In addition, over the holidays Nadia held a special promotion in which for every piece of jewelry purchased a piece of jewelry was donated to the women staying in the Hubbard House Emergency Shelter. Recently, Nadia reached out to us in a letter explaining a little bit about her background and why she supports Hubbard House. “I should begin by saying I never saw myself becoming a business woman. Growing up in New Orleans, I moved around a lot, I mean a lot. Because of the type of relationship my mother had committed to being in, my brother and I were bounced around from a safe place to back at home dozens of times over. My mother was a battered woman for almost a decade. The type of environment I was raised in could have devastated my future. Thankfully, God had different plans. I’ve recently graduated with a Bachelors Degree in Business Studies and am running my online venture, Veritas Boutique, with much appreciated success. 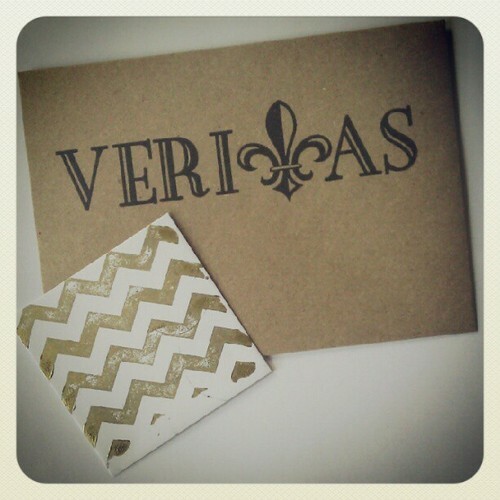 What I love so much about my business is that each month, Veritas Boutique gives 20% of our profits to a non-profit. To see Nadia’s collection and others at Veritas Boutique, visit http://www.veritasboutique.com. If you are interested in donating your time, talent or treasures to help us continue to serve victims of domestic violence and their families and to help prevent future abuse please call 904-354-0076 or visit www.hubbardhouse.org/help. Hubbard House, the domestic violence center serving Duval and Baker counties in Northeast Florida, was awarded a $14,000 grant from The Verizon Foundation to help fund its Creating Opportunities and Career Help (COACH) program. The COACH program started in 2011 as a result of a grant from the COACH Foundation and is designed to help survivors of domestic violence secure economic stability through rewarding employment. Domestic violence survivors often feel they must choose between an abusive relationship and economic hardship. The two-fold program establishes and maintains mutually beneficial relationships with Jacksonville employers while working alongside Hubbard House participants. By helping victims find and maintain employment the program will have a sustainable impact on their ability to have financial independence and an opportunity to live a life free of violence. Since the inception of the COACH program, 32 survivors of domestic violence have either gained employment or received a promotion. For more information about the COACH program please contact Kathryn Swanson, Career Specialist, at kswanson@hubbardhouse.org or (904) 354-0076 ext 262. ABOUT VERIZON: Verizon Communications Inc. (NYSE, Nasdaq: VZ), headquartered in New York, is a global leader in delivering broadband and other wireless and wireline communications services to consumer, business, government and wholesale customers. Verizon Wireless operates America’s most reliable wireless network, with nearly 96 million retail customers nationwide. Verizon also provides converged communications, information and entertainment services over America’s most advanced fiber-optic network, and delivers integrated business solutions to customers in more than 150 countries, including all of the Fortune 500. A Dow 30 company with $111 billion in 2011 revenues, Verizon employs a diverse workforce of 184,500. For more information, visit www.verizon.com. ABOUT THE VERIZON FOUNDATION: The Verizon Foundation helps people to live healthy, safe and independent lives by addressing disparities in education, health care and sustainability. Since 2000, the Verizon Foundation has invested more than half a billion dollars to improve the communities where Verizon employees work and live. Verizon’s employees are generous with their donations and their time, having logged more than 6.2 million hours of service to make a positive difference in their communities. For more information, visit www.verizonfoundation.org. In its 10th anniversary, National Stalking Awareness Month is continuing to empower those affected by stalking with important information regarding prevention, acknowledgment and resources about the crime. Because stalking, like domestic violence, is a crime of power and control, Hubbard House, the domestic violence center serving Duval and Baker counties in Northeast Florida, wants you to be aware that it can happen to you and how to prevent it. Lurking around your workplace or your neighborhood. An occasional meeting with the same person could be a happy accident, but repeated meetings could mean that they are stalking you. Being watched. This can include them taking pictures of you, asking your friends about you and even hiring a private detective to find out all they can about your personal life. Repeated phone calls. This can include them hanging up upon your answer or silent messages left on your answering machine. Finding yourself in the position of needing to be rescued. Let’s say on the way to work your car stalls, but this time it’s not a desperate attempt to save money by riding as far as you can with the gas light on, you just filled up yesterday. A stalker may set up a situation like this to be able to be the hero. While some “heroes” can be genuine, it is better to be cautious with someone you don’t know. Manipulation. Some stalkers may be so desperate for your attention that they will threaten to harm themselves or others if you don’t return their affection. Internet stalking. Internet stalking has become more popular with the growth of social media. Be careful what information you share, such as your address, phone number, and of course, your social security number. Defamation of character or insults. These negative statements may prompt you to withdraw yourself from the public eye. That is exactly what stalkers want; they want to isolate you. Violence. Any unwanted form of physical contact is a form of violence. Report it. Cumulative unwanted contact of any kind. You don’t have to have all of these incidents happen to you for it to be considered stalking. Even just one of these signs may mean you are being stalked, and are at risk. If you are experiencing any, or all of these warning signs, contact your local police and put an end to it right away. 81% of women who were stalked by a current or former husband or cohabiting partner were also physically assaulted by that partner. 31% were sexually assaulted by that partner. Vary your routines. This includes varying routes to work, school, the grocery store, and other places regularly frequented. Get a new phone number, but leave the old number active and connected to an answering machine or voicemail. Save any messages from the stalker. These messages can be critical evidence for law enforcement to build a stalking case against the offender. 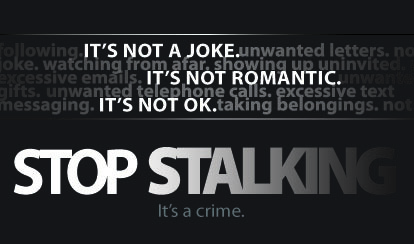 Do not interact with the person stalking or harassing you, this may reinforce their behavior. Consider obtaining a restraining order. You can visit the websites below for more resources about stalking, or if you feel as though you are being stalked call the hotline number listed to speak to someone immediately. If you feel like you are in immediate danger please call the police. Knowledge is power. Take this quiz to see how much you really know about stalking. View this video for ways to protect yourself from a stalker. Stalking is dangerous and shouldn’t be taken lightly. Don’t let it become a problem in your life. Put these ways to protect yourself in effect and get help if you feel you are being stalked or harassed in any way.